With cookie season just around the corner, I've been working on ways to help my Girl Scouts be really successful this year! When I passed out the cookie order forms to my girls on Tuesday, they saw that their incentive at the 800 box mark would be an American Girl Experience. So naturally, all 25 of my girls want to earn it! I told them if they wanted to make a bunch of sales, they needed to make sure they are saying "thank you!" So I made up these thank you cards for them! I printed them on a heavier card stock, but you really don't have to, you can just print them on regular paper. And cut the paper in half, then fold and have your girls write their own personal note inside! Go ahead and download them here! 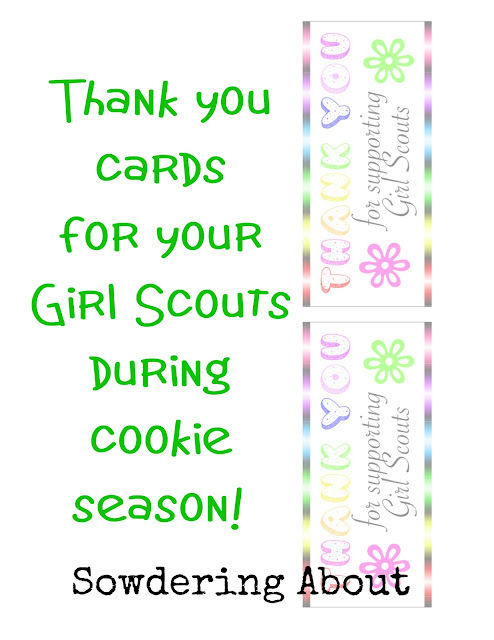 For more Girl Scout Cookie fun, click below!